Sydney Shop Girl: Life Continues, Almost Carelessly. The artist Plantu's cartoon for LeMonde. 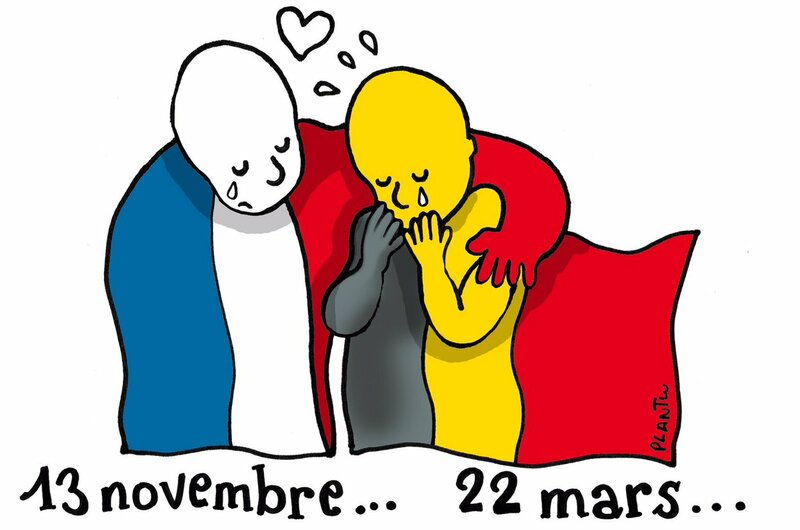 It wouldn't be right to blog today without acknowledging Brussels. And before it, Istanbul and for what seems like always - places like Syria, Yemen and Palestine. The hatred that precipitated these attacks is beyond religion yet it is so easy for many of us to define certain religions by it. It's a sorry fact of our world's history that at some point or other, virtually all our recognised religions have been used as a guise to commit unspeakable atrocities on fellow human beings whose only mistakes are often to be vulnerable or to follow another faith. Which makes us all the same, flawed individuals - no matter what we do or do not believe in a spiritual sense. It would be too easy to for us all to acknowledge this of ourselves and each other simultaneously, wouldn't it? To just stand and to just be together. For all our love of technology and convenience in our daily lives, we ironically seek complexity and create hyporcrisy in the moral compasses we choose to direct our lives. As always, carelessly it seems to me, life has continued as usual for us in Sydney. With carefree walks in the autumn rain. Lavishly accessorizing for a long lunch with a good friend. Spending a few minutes with our children at daycare (I stand corrected, I have been told that 'daycare is for babies' and that it's actually 'preschool') as we wait for them to be ready to come home. A short history of Zara in my wardrobe in today's outfit. The jacket was from Zara London, circa 2012 and the black shift dress with tie detail was from Zara Singapore, 2016. And wearing whatever we want for a day at work without the high risk of not making it to work alive, being attacked at work, not having any electricity or running water at work or not being paid fairly for the day's work. When my daughter was in daycare, she had "corrected" me a few times on the term of daycare.